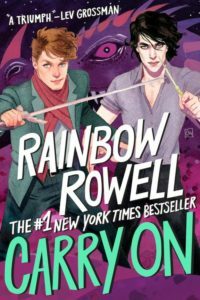 Rainbow Rowell books are the written equivalent of a weighted blanket and cup of tea. The moment I open one, I feel immediately comfortable and content. There is something inherently warm about her writing so much so that even when the characters are in tough situations, I’m just happy to be there. Carry On, well, carries on this grand tradition and I am just tickled pink that she wrote it. I’ll probably reread Fangirl this year because it was my first and always favorite of her books (I gave my sister a copy for Christmas, I put it at 2% odds she ever reads it) and while Simon Snow was a pretty central part of that story, it was in such an indirect way I never expected Rowell to spin it off. But she did. And I am so h*cking pleased. Simon Snow is the Harry Potter of the universe Rowell created in Fangirl, in that it is a fictional book series about a young boy who learns he is a wizard and goes to wizard school and fights the wizard bad guy at the end of each year – and Rowell went and gave us a g-d Simon Snow book! And it is wonderful! It’s Simon’s last year at Watford, with his best friend Penny and his girlfriend Agatha, and the Humdrum is only getting worse and his awful roommate Baz has never showed. Adventure ensues. Rowell delivers what is effectively book 7 without EVER giving us books 1-6 and, because it’s her, it works beautifully. The world of Simon Snow is fully developed even here, beginning at the end. I love it, I love it so much. This book is also great for fans of Harry Potter because it feels just a bit like home, but new and different and special in its own way. Also I genuinely loved the ending for Agatha. You go, girl.